Fritz and Mike attend the Jagermeister Winter Tour in New York City! On Tuesday, February 15, 2011, Fritz and Mike of Fritz's Polka Band made the trip to New York City to check out the Jagermeister Music Tour. It was held at the Best Buy Theatre and featured Buckcherry as the headliner. Fritz and Mike had a blast meeting old friends from the "Jager Family" that evening, as well as making new friends. Below are 12 pictures taken that festive night. Xavier Muriel of Buckcherry pounds the skins during the Jagermeister Winter Tour in New York City on February 15, 2011. Jimmy Ashurst, Josh Todd, and Stevie D. of Buckcherry tear through a tune during the Jager Winter Tour on February 15, 2011 in New York City. Vinnie Paul, drummer for HELLYEAH is shown during the Jager Winter Tour on February 15, 2011 in New York City. Fritz is pictured here with his pal, Ryan, at the Jager VIP Party during the Jager Winter Tour in New York City on February 15, 2011. During the Jager Winter Tour on February 15th, Fritz says "It's awesome being in a Jager band and attending a Jager Music Tour as a VIP!" Mike is "Havin' Fun" (as the song goes) at the Jager VIP Party on February 15th during the Jagermeister Winter Tour. 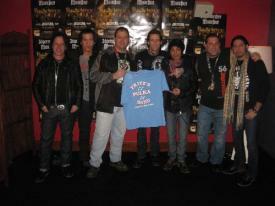 Fritz and Mike present a Fritz's Polka Band t-shirt to Buckcherry backstage at the Jager Winter Tour in New York City on February 15th. Mike and Fritz are pictured here with Jack Carson, Jagermeister Tour Manager on February 15, 2011 in New York City. Fritz is pictured here with Elizabeth, one of the Jagerettes, on February 15th at the Jager VIP Party during the Jager Winter Tour in New York City. Fritz is shown here during the Jagermeister Winter Tour in New York City at Best Buy Theatre on February 15th. Mike and Fritz are pictured here with Charlie from Sidney Frank Importing Company during the Jager VIP Party in New York City on February 15, 2011. On February 15th, prior to going to the Best Buy Theatre for the Jagermeister Winter Tour, Mike and Fritz stopped by Planet Hollywood.